Marysville’s Jack Christian drives to the basket for two of his game-high 18 points on Tuesday. Christian later hit the buzzer-beating three-pointer that gave the Monarchs a 55-54 win over Big Walnut. Marysville High School sophomore Jack Christian didn’t have any doubt about what would happen next when he let fly a long three-pointer at the final buzzer Tuesday evening. “I knew it was going in when it left my hand,” he said. Christian was spot on as his trifecta gave the Monarchs (8-10) a 55-54 non-conference victory over Big Walnut. “I’ve been saying for the past couple of years that Jack is a really, really good shooter,” said MHS coach Ryan Grose. “There’s no secret to becoming a good shooter, except getting in the gym and shooting. For the longest time, it didn’t look like Christian or any other Monarch for that matter would be in a position to win the game with last-second heroics. The Eagles (11-8), who led 32-28 at halftime, maintained a healthy advantage throughout the third quarter. 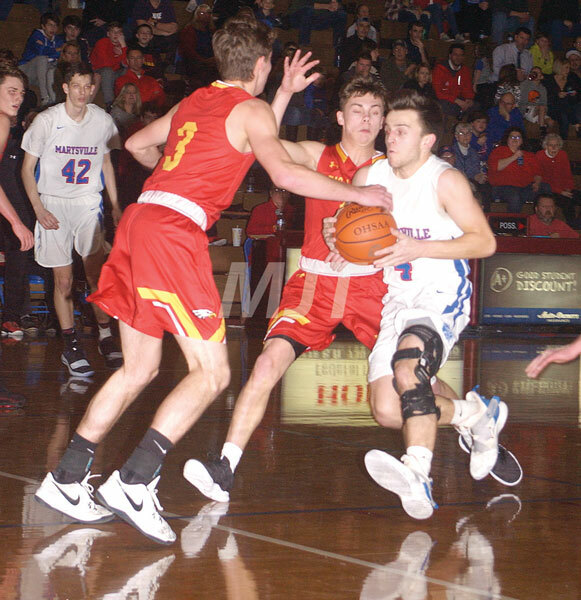 “We didn’t get defensive stops, we turned the ball over and we didn’t hit shots,” said Grose in explaining how the visitors from Delaware County at one point held a 45-31 advantage during the third stanza. All that began to change once the final eight minutes of action got under way. Phillip Hughes put on a drop step, scored and drew a foul. His free throw reduced MHS’ deficit to 45-36. The Eagles got their lead back up to double digits on a basket by Jagger Barnett. Christian assisted on a bucket from Bodie Eberhart to make it a 47-38 game in favor of Big Walnut. Fans could sense, however, that the momentum was starting to shift toward the Monarchs approximately two minutes into the final quarter. Christian nailed a pair of charity tosses to slice the spread to 47-40. At that point, the Eagles, who had controlled the clock for much of the game with their slower-paced, motion offense, began withering under some intense defensive pressure. The Eagles came up with three empty possessions over the next several minutes. Hughes scored on the offensive glass to pull Marysville to within 47-42 with 3:30 on the timer. “Philip made some big baskets tonight,” said Grose. Marysville’s defense forced another BW turnover that Eberhart converted into a basket. Brody Lawhun briefly quieted Monarch Nation with a three-ball that gave the Eagles a 50-44 advantage with slightly less than three minutes to play. Hughes hit a bucket to cut the lead to four and MHS’ defense came up with yet another turnover. Eberhart came up with a big trifecta that pulled the Monarchs to within 50-49 as the clock raced toward the two-minute mark. “That was a huge shot by Bodie,” said Grose. Jordan Koebel gave the Eagles a little bit of breathing room with a jumper that produced a three-point edge. Things looked a bit dicey for the Monarchs, who will host Upper Arlington for Homecoming on Friday, when Carson Becker’s bucket with 95 ticks on the clock gave the visitors a 54-49 margin. Christian then buried his next-to-biggest trifecta of the night. He tickled the twine with a shot that closed the gap to 54-52 with 1:26 left in regulation. MHS called a 30-second timeout and then forced an Eagle turnover at the one-minute mark. The Monarchs missed a shot, but BW turned the ball over on the rebound. Marysville burned its final timeout with 27.1 seconds to play, but then lost possession of the ball. MHS had to foul in order to stop the timer at 11.2 seconds. The Eagles were in the bonus when Koebel was sent to the free throw line for the one-and-one. He missed the front end and Hughes swept in for the rebound. Christian picks up the narrative from there. “I knew Joey (point guard Duke) was going to make something happen with the ball in his hands,” he said. “The other guys set screens that allowed him to get free and get me the ball. Christian 5-4-18, Eberhart 6-0-14, Hughes 6-1-14, Duke 2-0-5, Schaeffer 1-0-3, Taylor 0-1-1, Siefring 0-0-0, Brown 0-0-0, Mills 0-0-0. Totals 20-6-55. Three-point goals: Christian 4, Eberhart 2, Hughes 1, Duke 1, Schaeffer 1. Koebel 5-2-18, Barnett 5-0-11, Lawhun 4-0-10, Montgomery 2-0-5, Becker 2-0-4, Podraza 2-0-4, Hienton 1-0-2. Totals 21-2-54. Three-point goals: Koebel 2, Lawhun 2, Barnett 1, Montgomery 1. MHS’ freshmen and jayvees also won their games over the Eagles. The frosh triumphed, 44-31, as Josh Lim scored 10 points. The Karnes brothers, Riley and Tristan, respectively tallied 17 and 13 during the reserves’ 55-41 verdict.